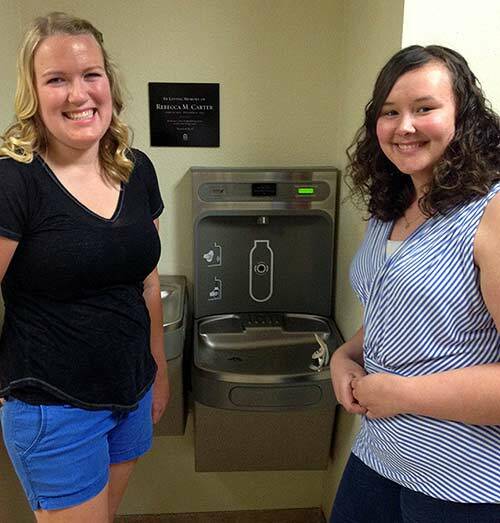 REDDING, Calif. - Simpson University’s graduating seniors secured a Healthy Shasta grant this spring to help set up a water-bottle filling station on campus as a class gift. 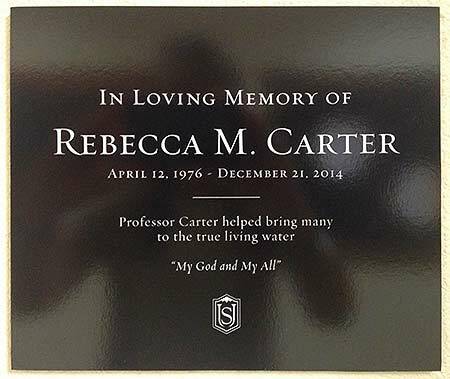 The station, installed this spring on the first floor of the Owen Student Services Center, is dedicated to psychology professor Rebecca Carter, who passed away in December. The university’s new Science and Nursing Center, which opened this fall, was built with a multiuse water fountain. Noting its popularity, senior class president Desteni Lord and classmate Katie Christie, a student relations assistant in the Alumni Office, discussed how another filling station would be an ideal senior class gift to the university. “We wanted to bring something on campus that would benefit not just students, but faculty, staff and visitors,” said Lord, a psychology major from Redding. Christie, a business administration major from Sonora, Calif., was learning about surveys in a business marketing class when information about the grant was presented to seniors. Christie talked to business professor Wally Quirk about sending an electronic survey to staff and faculty to gather data on campuswide interest in multiuse fountains. Lord, who worked closely with the Student Development Office in applying for the grant, also distributed paper surveys to student leaders during a Student Senate meeting. The survey received 87 responses, overwhelmingly in support of additional water-bottle filling stations. The Healthy Shasta grant awarding committee was impressed by the student initiative on the project, said Cameron Lievense, worksite wellness coordinator. The university, along with the cities of Redding and Anderson, received $1,000 in grant funding for the water stations, which allow users to quickly full upright water bottles. Two-thirds of the respondents stated they would drink more water daily with more fountains on campus. Lord had four classes with professor Carter and wanted to do something to honor her memory. A special memorial plaque was presented during the recent Senior Banquet hosted by the Alumni Office. Photo, top: Simpson University senior Katie Christie, left, and senior class president Desteni Lord stand by a new water-filling station, dedicated to professor Rebecca Carter, in the Owen Student Services Center. The senior class earned a grant from Healthy Shasta to help pay for the station, which is the class of 2015 gift to the university. Healthy Shasta is a partnership of more than 20 organizations that seeks to promote healthy and active living among North State residents. Learn more at healthyshasta.org.